New mural on Trade St in the Arts District!! The colorful mural was painted by Nico Amortegui on a recent Sunday. More of Nico’s work can be found at Red Dog Gallery at 606 N.Trade Street. More about the story behind the mural or the artist is on the website www.theafasgroup.com. 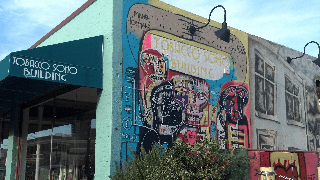 The historic building known as the Tobacco Soho Building, is no longer a place where one can buy tobacco products. Instead, the building is the home of 2 art gallery collectives and a hair salon. This entry was posted in AFAS Group and tagged AFAS group, artist, downtown arts district, mural, Nico Amortegui, Red Dog Gallery, Tobacco Soho Building, trade st. by Deborah Willard. Bookmark the permalink.